" Dogs are not our whole life, but they make our lives whole ". I'd be happy to have my biography be the stories of my dogs ! We are located in East Central Indiana (one hour from Indianapolis) and are situated on two acres of lovely land fenced for our companions, with lots of shade . We have a litter maybe once a year so others can have this golden companionship for the rest of their lives also. We breed for intelligence, beauty and disposition. Our goal has and always will be to produce healthy, happy Golden's who will grow with their families and provide as much love and happiness as our dogs provide to us. Our puppies are highly socialized and come from Champion foundation lines with generations of health clearances. 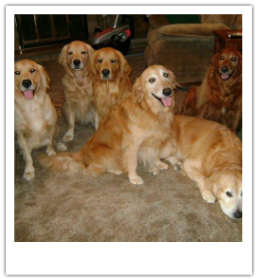 Our Golden's are Therapy/Obedience dogs. All our puppies come with 24 months genetic health guarantee. We offer this because our puppies come from strong pedigrees with sound, healthy lineage. Our foundation line is listed with K9 Data and speaks for itself. It is very important to us that your companion for life has the best start in life as possible. 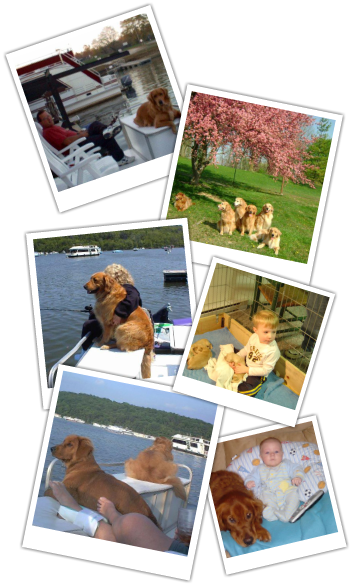 Golden's are not our whole life but they make our lives whole.The dogs always have gone with us camping. We had a houseboat and several other boats and they loved the boating and swimming and chasing after the ducks. I ask John if he ever regrets moving me to the country so we could have our dream that started with one golden and now includes seven. Even with all the grooming of our dogs and other breeds, becoming a Certified AKC CGC Evaluator, and much more to come once we retire with the dogs, he says never. We will always have a golden in our lives and work with dogs and I have planned this to our old age together. It will be John and I and our 7 babies/companions till we cross the Rainbow Bridge.